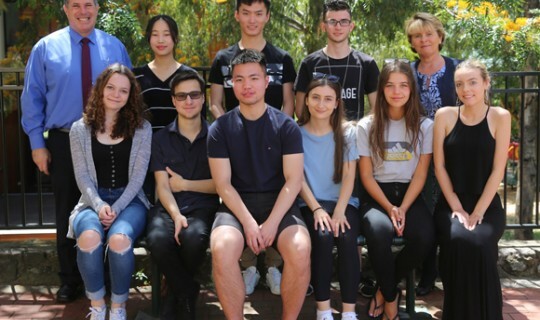 Once again the students of the Greek Community’s Language and Culture (GLC) school and Alphington Grammar School have excelled in their Classical and Modern Greek final VCE exams. Of the GLC cohort studying Modern Greek Theofanos Tsentikopoulou achieved an ATAR of 49, Helen Ioannou 47, Despina Haidemenos 46, Harry Giavris and Nikolaos Roumbos each secured ATARs of 41 each whilst Joanna Skaltsa and Irene Kalergis also excelled with ATARs of 40. "Apart from these excellent students, noteworthy high scores were achieved by other students as well, which shows the quality of our teaching program, the highly qualified teaching staff, the nature of the pedagogical approach and diligence of the students of our schools," said Mr. Manos Tzimpragos, principal of the GLC program. Equally outstanding was the performance of our students in the VCE Classical Greek stream. Given the difficulty of the course, three of our students were the best performers in Victoria with Jason Wong securing an ATAR of 38, Karyakos Douros a 37 and George Gabriel a 36. Their scores for this challenging subject were scaled up to 50.6, 49.27 and 48.7 respectively. It should be noted that after considering scaling, eight of our eleven students ranged between 40 and 50.6. Again this year, Alphington Grammar School (AGS) had an admirable record number of students achieving top ATAR scores for their final VCE exams. The highest ATAR score of 98.15 was achieved by Shawn Lin followed closely by another 5 very able students. All students served the School with distinction in both curricular and co-curricular activities and these students will have secured their chosen courses of entrance in 2017. It is worth noting that, a score of 40+ indicates students are in the top 7.5% of the State. Mr Theo Markos GCM’s Vice President and Education Convenor commented: “We are extremely pleased with the results achieved by our students in both Modern Greek and Classical Greek. Obtaining the top 3 marks in the state of Victoria for Classical Greek is a fantastic result and clearly vindicates our Board's decision to introduce this subject into our Curriculum 5 years ago. Congratulations to all our students who worked diligently throughout the year as well to all our teachers who have shown a remarkable commitment and passion in promoting the learning of Modern Greek and Classical Greek.